The far-right Spanish Vox party has been barred from taking part in the only scheduled televised debate ahead of parliamentary elections on April 28. The reason given by the electoral commission for its decision was its poor score at the last vote in 2016. It followed a complaint from several small parties that they had been excluded. Spain’s private Atresmedia network had planned to include Vox alongside the four main national parties for a debate five days before the elections, after its surprise success in regional elections in Andalusia. The anti-immigration party won nearly 11% of the vote in December, winning 12 parliamentary seats in the southern region. The TV debate on April 23 is the only one in which the socialist Prime Minister Pedro Sanchez has committed to take part. The other three parties due to be represented are the conservative Popular Party (PP), the left-wing Unidas Podemos, and the centrist Ciudadanos (Citizens Party). The electoral commission – the Junta Electoral Central (JEC) – ruled that to include Vox would breach the “principle of proportionality” in electoral debates, which demands that parties have national parliamentary representation and a certain percentage of the vote. But at the last national elections in 2016, the commission said Vox had won only “0.1% of the vote” – 46,781 in all. Three small parties – the Republican Left of Catalonia (ERC), the Basque Nationalist Party (PNV), and the Canarian Coalition (CC) – had brought a complaint about Atresmedia’s original line-up. The TV channel has re-scheduled its debate to include only the four main parties but intends to challenge the electoral commission’s ruling in Spain’s supreme court. Vox’s leader Santiago Abascal took to Twitter to denounce the decision. “It’s clear who’s still in charge in Spain: the separatists,” he wrote, vowing that “a great victory for #LongLiveSpain will propel the outlawing of those who want to tear up our coexistence, our Constitution and our Homeland”. Critics have accused the party of being a throwback to the Franco era, with its appeal to nationalist sentiment with slogans such as “Spaniards first”. It has denied that its use of terms such as “Reconquista” (Reconquest) amounts to an attack against Spanish Muslims. The party has also called for a crackdown on illegal immigrants and independence movements. Its plan to reform a law on gender violence has brought accusations that the party is anti-feminist. Abascal has mooted an “ideological battle against progressives” over issues such as gay marriage and multiculturalism, deriding government “traitors” supported by “enemies of Spain”. 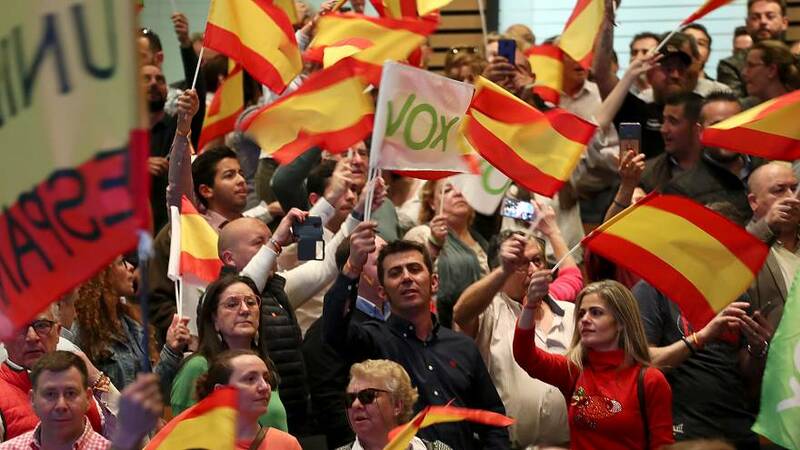 Vox resents being described as far-right, saying that in Andalusia it has responded to issues concerning ordinary people such as unemployment, crime and border protection. Opinion polls have suggested it may win around 10% in this month’s national parliamentary vote.